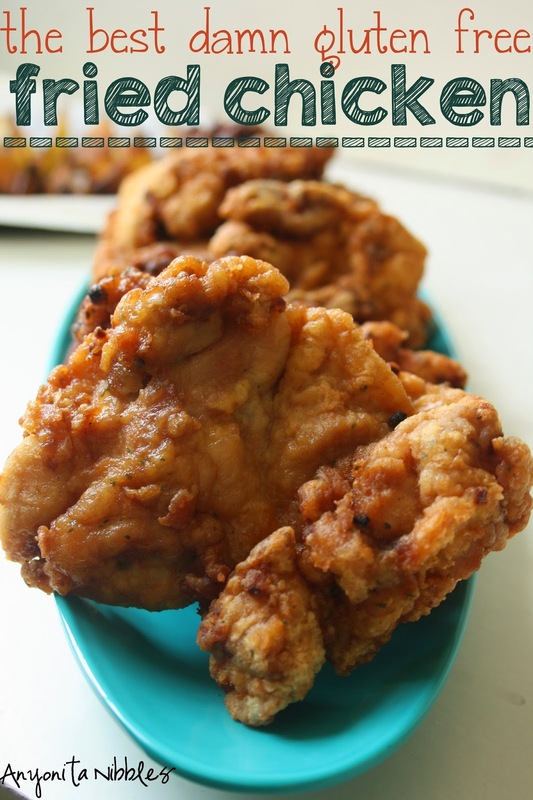 Growing up, fried chicken was a staple food group at our house. My mother would spend hours frying chicken and serving it with a rotation of vegetables and side dishes. I was raised on fried chicken, I'm talking about that good, Southern fried chicken that's so juicy and perfectly golden. Chicken so good it'll make you cry. That's what I'm used to eating and it was one of the things I knew I'd miss most when giving up gluten. In the first few weeks of going gluten free, my mouth would water every time I drove past KFC. I longed for that delicious fried chicken; practically ached for it. It was that desire that inspired me to come up with my own alternative that would be Coeliac friendly. For those of you who don't realize, KFC is one of the danger zones for people with gluten intolerance or Coeliac Disease. All that flour flying around, contaminating pretty much everything. It's just too risky. 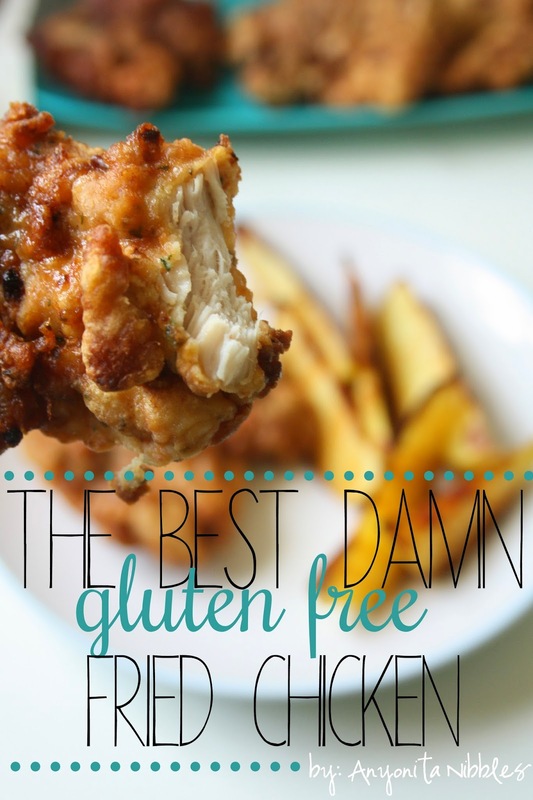 But follow this easy recipe for the best damn gluten free fried chicken and you won't even miss the gluten. Promise. I got the idea for this chicken after having an Indian takeaway one night. As always, we ordered poppadoms (little Indian fried crisps served with a range of chutneys, raitas and dips) and before I could eat them, I wanted to double check that they were indeed free of gluten. To my delight and shock, I learned that they're made from besan or chickpea flour, so they're completely, naturally gluten free. I began to question what other things could get coated in a dusting of ground and sifted chickpeas and immediately thought of succulent chicken thighs. The rest, as they say, is history. You could use ground almonds or almond flour for gluten free fried chicken, but personally, I think this makes the chicken taste a bit bread crumby and not like authentic gluten friend chicken. The besan flour gives the chicken the same texture as traditional fried chicken while still keeping it gluten free. If you can't find the Schwartz where you live, you could substitute for an equal amount of a rub made from onion and garlic powder, black pepper, dried parsley, brown sugar and either smoked paprika, ground mild chili powder or cayenne. Whisk the egg and additional yolk in a medium sized bowl with salt and the seasoning. Combine the flours in a separate bowl, the same size or larger. Coat each chicken thigh in the egg and then in the flour. Then lay each piece on the wire rack and let rest 10 minutes. Warm the sunflower oil in a deep saucepan or fryer. Fry the chicken once the oil is hot. Continue to cook the chicken until it is cooked through and the juices run clear when you pierce the plumpest part of the chicken. 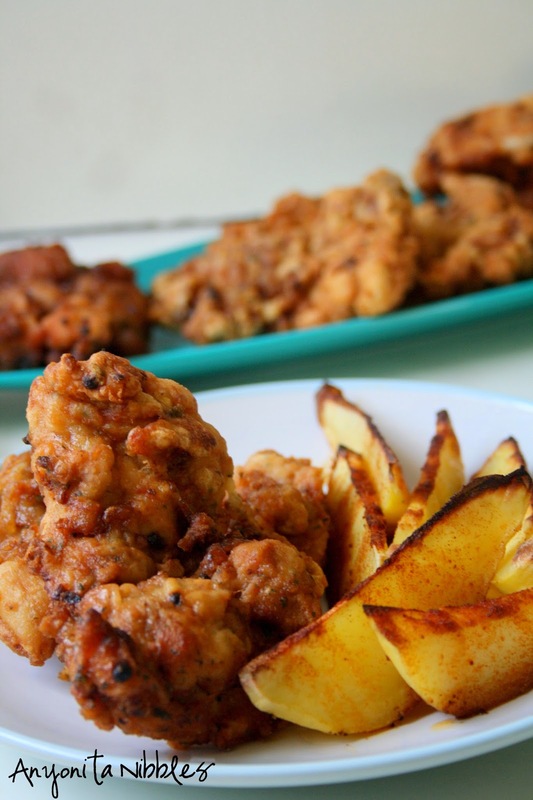 I served my fried chicken with oven baked potato wedges dusted with paprika, but you could serve yours with your favorite fried chicken fixings. That does look like "the best damn" fried chicken! :D Great pics! This looks amazing!! KFC's got nothing on you! YUM! You've outdone yourself!!! This looks awesome. Please come drop your most pinned recipe off today with me at My Life Well Loved and with Brandi at Aunt Bee's Recipes FB page. THANKS!! I know what you mean about fad diets and I agree. Unfortunately for me, I've got Coeliac or Celiac Disease so I'm forced into a gluten free lifestyle. Finding ways to make my favourite foods suitable for my disease is one of my biggest passions now. :) thanks for stopping by! This looks amazing! I would never of guessed it is gluten free. Man that chicken looks good. I will be making this soon. Pinned thanks for sharing it with us on foodie friday... amazing looking, really. How well does this recipe travel? Is it good cold? How well does this chicken travel and is it good cold? You know, I've never had it cold because it doesn't tend to hang around long enough for there to be leftovers! But I don't see why it wouldn't be okay cold, the chickpea flour basically behaves like normal flour. Thank you for a great recipe!!! 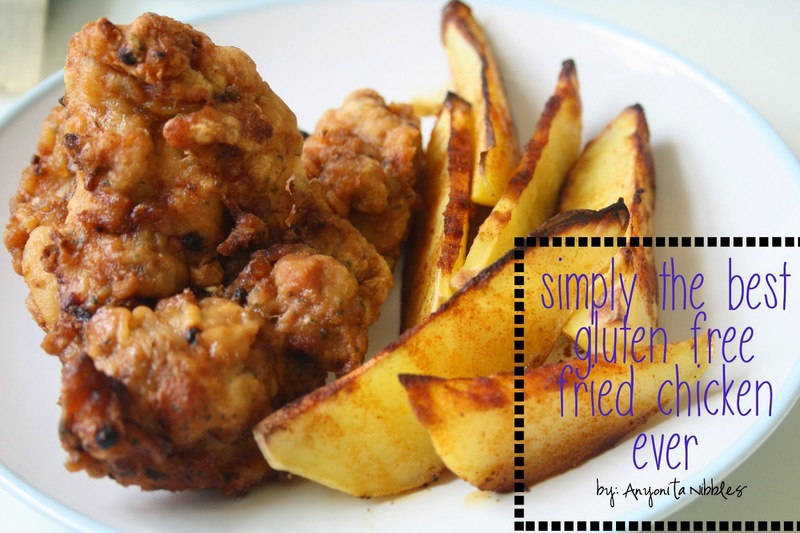 Finally a fried chicken that is gluten free and tasty at the same time!!! Oh I want this for breakfast now! 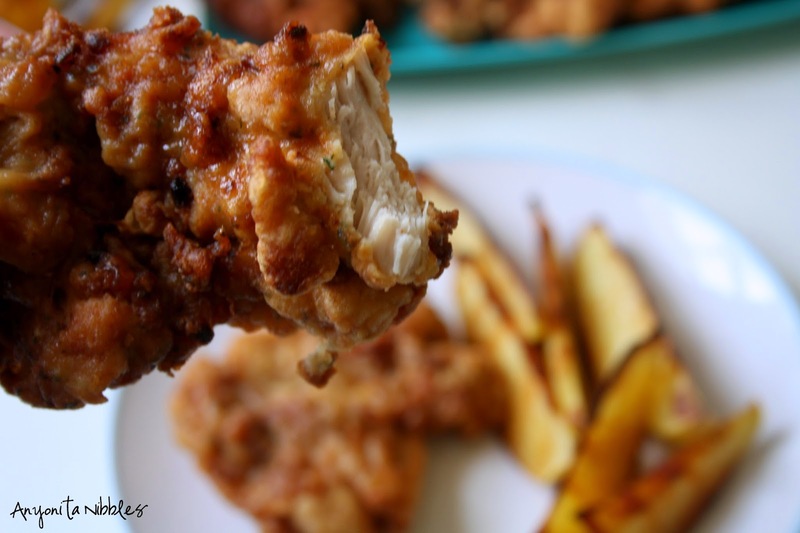 I'm always looking for different fried chicken recipes and this I will have to make soon. I came by from Cooking and Crafting with J & J and thanks for sharing recipe. Holy moly this looks incredible! I definitely have my cravings and need a good GF fried chicken sometimes, so I will have to try!